Recently I had the opportunity to try out the online task tracker from Asana. There is a sea of task tracker applications out there, and this one was pretty simple to use. It allows up to 30 members to be added to your "company" for free and then they have monthly pricing plans if you need more. Adding a project and tasks to your project is a snap. 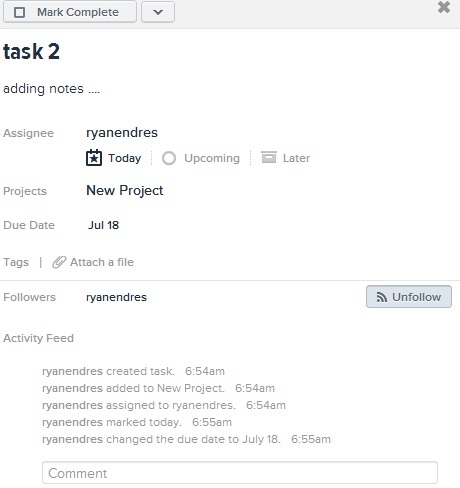 With each task you can add comments, files, and indicate when you are going to work on it. It is set up, so each day when you come in you would indicate what you are going to work on and then it is visible to everyone so they are aware what you are working on. I like the idea of creating a task, and adding a due date and then assigning it to a resource manager (assuming that a person is not assigned to your project). The resource manager then would assign it to a person in their resource pool and it would then show up in their work cue. 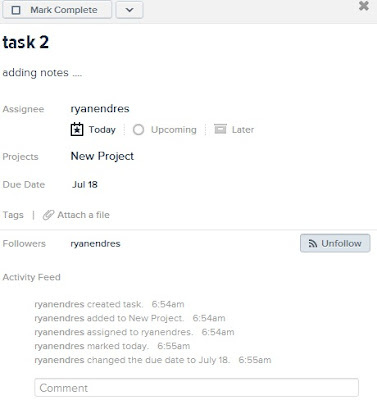 It also has a Facebook like newsfeed so you can see what is happening on your project as tasks are updated. Overall I like the application, and I think it would work well for small projects and smaller organizations. It is, after all, just a task tracker, not a tool like Microsoft Project. If you need to track things like hours, dollars, how tasks relate to one another (task 1 needs to be completed before we start task 2), or easily shifting out multiple tasks deadlines out due to a shift in the project end date, then this may not be the application for you. That being said, I really do think we are going to see the shift to products like this that show transparency of what is happening at any one moment at the project level and at the individual resource level. the issue was asana site is that it is not free. Another cool application that is free is www.trello.com - i like it since it has no amount to be paid.